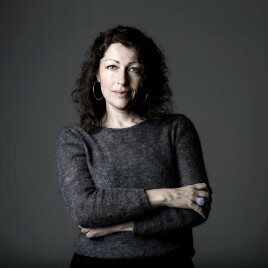 born in 1965) – Swedish writer, journalist and playwright. In 2009, she was nominated for the August Prize for her book Och i Wienerwald står träden kvar / W Lesie Wiedeńskim wciąż szumią drzewa, in which she showed the difficult and complicated history of Sweden and Europe through the prism of the history of the most famous Swedish furniture company (Polish edition was released in 2013). In 2011 she received the Kapuściński Award for her work. Her two subsequent books were also published in Poland: Smärtpunkten: Lars Norén, pjäsen Sju tre och morden i Malexander / Czuły punkt. Teatr, naziści i zbrodnia (Polish release: 2014) and 1947 / 1947. Świat zaczyna się teraz (Polish release: 2017).